Koalas inhabit temperate regions along Australia’s east and southeast coasts. 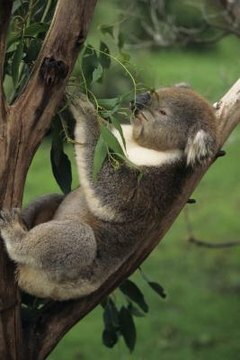 They feed exclusively on eucalyptus, living only in the scattered, often isolated forests where these trees grow. Koalas' range extends throughout eastern Queensland and New South Wales, most of Victoria and the southeastern tip of South Australia. Seasonal temperatures throughout these areas fluctuate around 20 degrees Fahrenheit, with slight variances from north to south. Through most of the koalas’ range, summer temperatures average around 80 degrees Fahrenheit, with Victoria in the south about 3 degrees cooler. South Australia, where koalas occupy a relatively small area, sees higher summer temperatures, about 84 degrees Fahrenheit. In eastern Queensland, koalas live in a subtropical climate, with summer temperatures around 86 degrees Fahrenheit. Sensitive to heat, these animals don’t occupy the northern parts of Queensland, where tropical summers can reach up to 120 degrees Fahrenheit. During the winter, low temperatures remain around 60 degrees Fahrenheit throughout koala habitat -- the coastal regions and forests of eastern Australia. Victoria and South Australia average in the high 50s, with Queensland climbing into the low 60s. Koalas are more comfortable in cooler weather than warm, and have a higher tolerance for cold than for heat. Koalas have thick hair and skin that help insulate them against cold. In the south, they tend to be slightly larger and have heavier hair, probably to help them through cooler winters. This fur also can deflect heat -- koalas usually become uncomfortable in temperatures above 80 degrees Fahrenheit. They don’t create nests, so they lack shelter during excessively hot and cold weather. If their arboreal habitats become too hot or dry, koalas might need to leave their trees to look for water. Australia is prone to severe droughts, bush fires and heat waves -- all conditions that can decimate eucalyptus stands and harm koalas. Excessive heat and aridity kill the trees. Bush fires, spread by wind and promoted by aridity, wipe out entire eucalyptus forests because of the trees’ oil flammability. Koalas don't move quickly and often perish in such fires. Ground travel is also hazardous for the animals; thousands die each year because of collisions with cars and predation by dogs. Scientists are researching strategies to help increase the animals’ chances for survival.